Singapore is a bustling cosmopolitan city of high-rise buildings, landscaped gardens and heritage-rich precincts. Home to a harmonious blend of culture, cuisine, arts and architecture, Singapore is rich in contrast and colour. Singapore is renowned for its world financial position, with its free trade economy, leading technologies and highly efficient workforce. But Singapore is also highly regarded for its great golfing experiences, and with over 30 golf courses to choose from no wonder keen golfers are making a swing through Singapore. A 4 night golf package staying at top quality hotels and resorts and playing some of the best golf courses in the region. One round of golf at Sentosa Golf Club and a minimum of two rounds at Ria Bintan Golf Club. This exclusive golf club boasts two of the most scenic and challenging championship 18-hole golf courses in Asia, making a visit to the Sentosa Golf Club a golfer's dream come true. Designed by world-renowned golf course designer Ronald Fream, The Serapong Course was opened in 1982 and measures 6,493 metres from the championship tee. A challenging par-72, it is one of the top five championship courses in Asia and home of the prestigious Barclays Singapore Open. In 2007, The Serapong Course underwent an impressive S$12 million upgrade under the guidance of Andrew Johnston of the Bates Golf Design Group. With its trademark mounds and undulating terrain, two mammoth lakes with stone-lined walls and breathtaking scenery, Johnson enhanced the use of the Singapore harbour as a backdrop to accentuate play. The Serapong Course was awarded the "Number 1 Championship Golf course in Asia by Asian Golf Monthly in 2007 and Best Golf Course in Singapore" by Golf Digest in 2009. Opened in 1972, The Tanjong Course was originally designed by Frank Pennick. In 1993, with an investment of S$40 million, the course was remodelled and a spectacular new clubhouse was built. Sporting new contours featuring natural hazards, freshwater lakes, towering trees, rolling fairways with narrow landing areas and well-guarded Bermuda Tifdwarf grass at that time, the ever-popular Tanjong Course was nominated by Asian Golf Review as Singapore's best golf course for three consecutive years starting in 1997. A one hour ferry ride across the South China Sea from Tanah Merah terminal in Singapore brings you to Bintan, Indonesia and the Ria Bintan Golf Club. 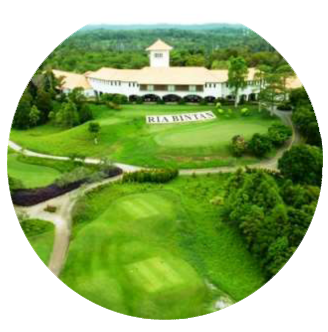 Ria Bintan Golf Club is a 27-hole championship course designed by world-celebrated golfing legend, Gary Player. Golf enthusiasts will appreciate the award-winning 18-hole Ocean Course and the 9-hole Forest Course. One of Asia's best-established and leading courses, Ria Bintan Golf Club has consistently been named the best golf course in Asia. The breathtaking Ocean Course features smooth fairways with beautiful views of the South China Sea. It was voted best Indonesian golf course in 2013. Surrounded by avenues of trees and serene lake views, the Forest Course provides a challenging game of golf with its various bunkers and fairways. Whether one is an accomplished golfer or just looking to improve one's golfing skills, a great golfing experience awaits. 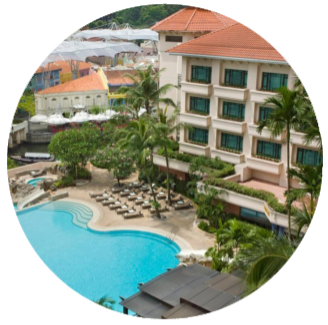 A luxury hotel ideally located by Clarke Quay, within walking distance of the financial hub of Raffles Place, and close to major places of interest including Orchard Road, Chinatown and the numerous bars and restaurants on the famous Clarke Quay and Boat Quay. The 476 beautifully appointed guest rooms and suites cater to the needs of the most discerning travellers, featuring state-of-the-art technology and exclusive amenities such as high speed internet. A sumptuous breakfast buffet offers a wide range of choices to energise your day. 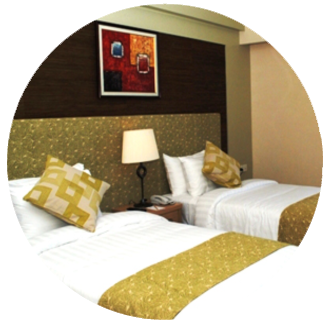 Recreational facilities include an idyllic pool area with water-slides and an outdoor Jacuzzi for relaxation. For an invigorating workout, there is a well-equipped two-level fitness centre that is open 24 hours a day. Spa & sport at Swissotel Merchant Court is the perfect haven to relax and recharge. The Ria Bintan Golf Lodge offers a memorable stay for those seeking the perfect golf vacation. Featuring 31 modern rooms, guests can soak in the picturesque views of the greens against the majestic South China Sea. Relax and rejuvenate after a gratifying game and experience the best of Indonesian hospitality at Ria Bintan Golf Lodge. After a challenging game at the multiple award-winning Gary Player golf courses, indulge in a massage at the Asmara Spa and revive those golfing muscles for the next days game.